Self-discovery can be a scary thing. When you live your entire life thinking you’re one thing and then discover a deeper truth, it’s confusing and nerve-wracking. This is something Princess Bubblegum is dealing with in “Jelly Beans Have Power,” an episode that delves deeper into the plot developments introduced in last season’s “Elemental.” PB and Slime Princess have cool new elemental powers after being experimented on by Patience St. Pim, but SP’s impressive control of her new abilities has made PB self-conscious about her lackluster new powers. SP can shoot huge waves of slime and even use them to propel herself through the air, but PB is limited to farting a single jelly bean at a time out of her palms. PB can’t tap into this new aspect of herself, and this episode explores what is holding her back. Written and storyboarded by Aleks Sennwald and Hannah K. Nyström, “Jelly Beans Have Power” is an introspective look at how to negotiate different aspects of your identity, and Patience St. Pim’s experimentation has left PB adrift, searching for an anchor. It’s a relatable idea interpreted through this series’ candy-coated fantasy lens, and while the circumstances are heightened and sensational, this episode has a valuable message at its core. It’d also one that I think kids need to learn, because identity isn’t something set in stone. People change dramatically over time, and it can be a real challenge to understand those changes and accept the person you’re growing into. This episode made me think a lot about my personal coming out process and how difficult it was to accept that I was gay even though it was clearly a huge part of who I was. The foundation of who I thought I was had been completely upended, and it took years for me to embrace that part of myself instead of being afraid of it. And when that acceptance finally did occur, there was a wave of regret that it didn’t happen sooner. Like PB being angry at herself that the scientist within her didn’t see the data, I was angry at myself for not seeing the obvious signs that I was trying to contain an essential part of my identity. But there’s no use in wallowing in the past. Those lost years were gone, and the only way to be a better person was to not make the same mistakes in the future. PB has always used science as the guiding principle of her life, so she’s thrown off by her recent changes for a number of reasons. To start, her elemental abilities are magical in nature, and she’s not comfortable embracing them because she doesn’t understand how they function. More distressingly, she’s questioning the scientist part of her identity because she never knew this crucial data about herself, so she feels even more like a failure. She’s disoriented and unsure of herself, but luckily she has a spiritual guide in Chatsberry, the ancient candy elemental. He’s there to help her look past her insecurities and connect to this new part of herself instead of denying it, and while it’s a slow process, she does take those steps needed to tap into her power. The steps are small at first, with PB learning how to fire a constant stream of jelly beans. She uses this to impress SP at teatime by moving the sugar across the table with an intricate course of ricocheting jelly beans, but PB is still far from the mastery of candy elements that Chatsberry shows her. PB needs more pressure put on her in order to realize her full potential, and that comes from a crystal aircraft in the shape of a paper fortune teller, which terrorizes the Candy Kingdom whenever anyone gives it a number. PB needs to act fast if she’s going to stop the attack, and she realizes that the only way to accomplish the kinds of feats Chatsberry is capable of is by using her scientist brain in conjunction with her new elemental abilities. By breaking down the chemical composition of the mints and soda she’s trying to create, PB is bringing two different sides of her identity together and making herself more powerful in the process. Science is what makes sense to PB, and she’s been drawing a line between her scientific brain and her elemental powers, keeping them apart when they should be informing each other. She can’t abandon the thing that has defined her in the past in order to tap into this new part of herself. She’ll never stop being a scientist, and understanding this fundamental fact makes it possible for her to evolve to her new state of being. Growing isn’t about leaving the person you used to be behind. It’s about taking that person and expanding and improving on it, and once PB realizes this, she becomes a badass candy elemental with incredible power. 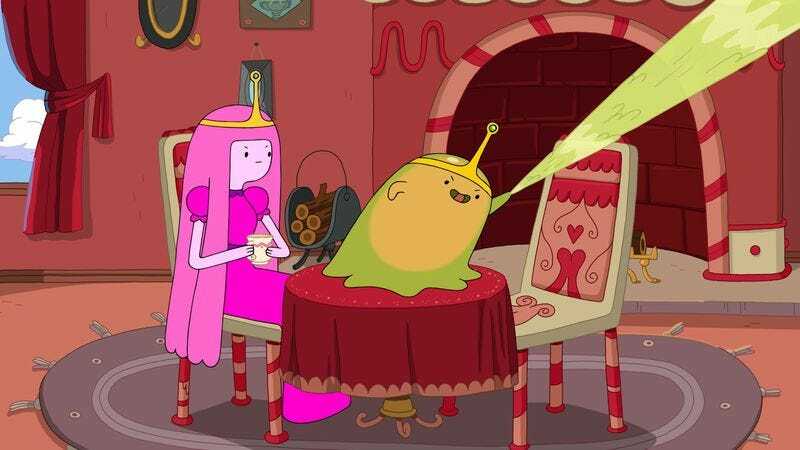 I need an episode of Adventure Time focusing entirely on characters voiced by Maria Bamford. 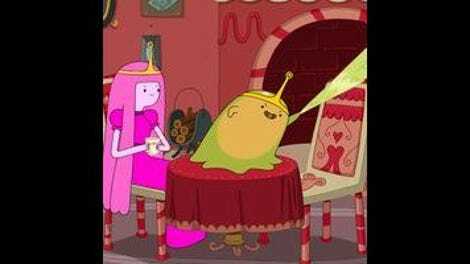 Maybe a Slime Princess/Raggedy Princess team-up pitting them against Huntress Wizard? She voices so many characters that there are a lot of ways to make this happen. I’m excited for the Patience St. Pim/Ice King partnership, mostly so I can hear Lauren Lapkus and Tom Kenny acting off each other.